Ever had one of those dreams that takes you over and is so convincing that when you wake up you are absolutely sure that it happened? On most occasions, if I’ve dreamt that I’ve had fight with someone I will wake up with a full blown grump at that person. I will, of course, have to give myself a good talking to and remind myself it was just a dream – especially before I actually see that person again! But last night, I dreamt of otters (“dreamt” coz it’s more poetic). Why, I have no idea at all. There have been no otters in my life. I have never met an actual otter. But this morning I woke up with the solid conviction that I had a pet otter – I had spent the whole dream-night playing with said otter, and could even feel his fur still under my hands. Imagine my disappointment to wake up and find no otter in the house. Self 1: Where’s the otter? Self 2: There’s no otter. It was a dream otter. You know that. Self 1: But … otter!! I still feel quite bereft, which is weird, mourning the loss of an otter I never had. So I’m spending part of the day watching otters on YouTube. This entry was posted in Random and tagged dreams, otters. Bookmark the permalink. I hate when awesome dreams give way to the cold, cruel dawn. You must be otterly despondent. 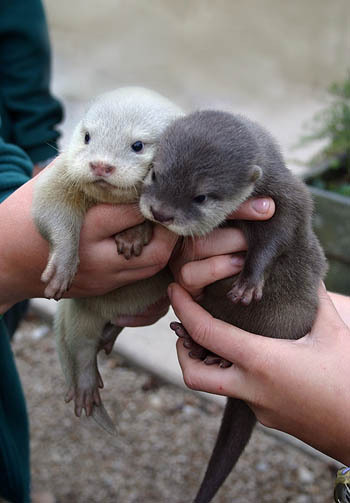 If you’re going to dream, a dream of otters is good. They’re fun. I like otters. Far better to dream of otters than sloths, for example. Or cane toads. No good ever came of a cane toad dream; even one full of cricket bats and golf clubs.